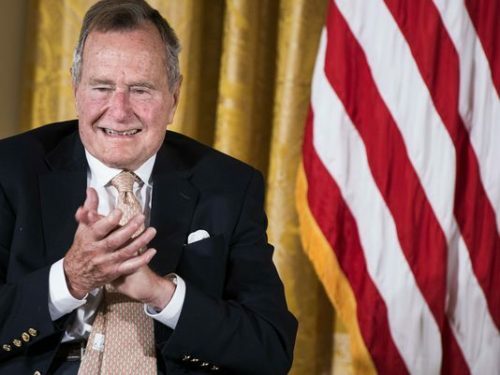 Former Republican president George H. W. Bush has died at the age of 94. President Bush died after years of poor health, including a battle with Parkinson’s, which confined him to a wheelchair. His wife, former First Lady Barbara Bush, died earlier this year at the age of 92. In 2013, twenty years after he left office, George H.W. Bush served as an official witness at the wedding of two women who were longtime family friends. Bush had no official comment on the act at the time, which was widely seen as a rebuke to the Republican party’s hardline against marriage equality–one that his son used to ride to re-election in 2004. Two years after the wedding, Bush Senior did elaborate on his position. Too bad Bush didn’t mellow a lot sooner. His presidency was an extension of the destructive anti-LGBTQ policies of the Reagan administration. Bush wasn’t always a hard-right politician. When he was running for the GOP presidential nomination in 1980, he was a country club Republican, not the direct heir of Barry Goldwater that Ronald Reagan was. Bush was a supporter of Planned Parenthood, favored the Equal Rights Amendment and represented the moderate wing of the party (long since deceased). But as Vice President, Bush embraced Reaganism with gusto, especially when it came time to run for president in 1988. He had no problem with the administration’s silence on HIV/AIDS. He also accepted the growing influence of the religious right in the Republican party, which made hatred of all things LGBTQ a cornerstone of their political efforts. Most of the energy in the Bush presidency was spent in fighting the AIDS crisis. And there Bush’s hands-off attitude exacerbated the AIDS epidemic. But the policy didn’t match the rhetoric. Bush continued the ban on HIV positive people from entering the U.S., effectively preventing international conferences on the disease from meeting here, and removed money from his budget for drug development and home and community care. With the death toll continuing to climb with no end in sight, Bush presided over some of the darkest days of the epidemic. In the end, Bush’s embrace of conservative orthodoxy didn’t do him much good. Right-wingers never trusted him. Televangelist Pat Robertson mounted a credible and for Bush embarrassing primary challenge in 1992, and the Republican convention that year gave ample airtime to Robertson, Pat Buchanan and other hateful figures. Bush recognized the danger that their fanaticism represented. He just didn’t do anything about it. None of this diminishes Bush’s service to his country in World War II and the personal decency that many now recall as a sharp contrast to the current president. That he eventually mellowed on gay issues is nice. But it was also 20 years too late. The time when Bush could have made improved the lives of LGBTQ citizens–especially those living with AIDS–was when he was president. And on that standard, he has to count as a failure.